ICF ELTA (Induction Crucible Furnace ELectro-Thermal Analysis) is a subject oriented two dimensional program developed to design of induction melting processes in induction crucible furnaces. This program provides a two dimensional simulation of electromagnetic and thermal fields in cylindrical induction system using both integral (a Method of Magnetization Forces) and differential numerical (a Finite Differences Method) methods. ICF ELTA is very simple for understanding, realization and in use. Induction system may contain not only induction coils with leads but also several components of power supplying circuitry: capacitors, transformers. ICF ELTA can calculate the electrical parameters of main induction coils with many variants of resonant circuits and different schemes of compensation: parallel; parallel with transformer; series; series with transformer; series-parallel; series-parallel with transformer; parallel-series; parallel-series with transformer, etc. ; short circuit coils for top and bottom parts of crucible. Classical crucible can consists of one or two layer of refractory between the induction coils and the melt required in furnaces withstanding the high temperature and heat transfer. 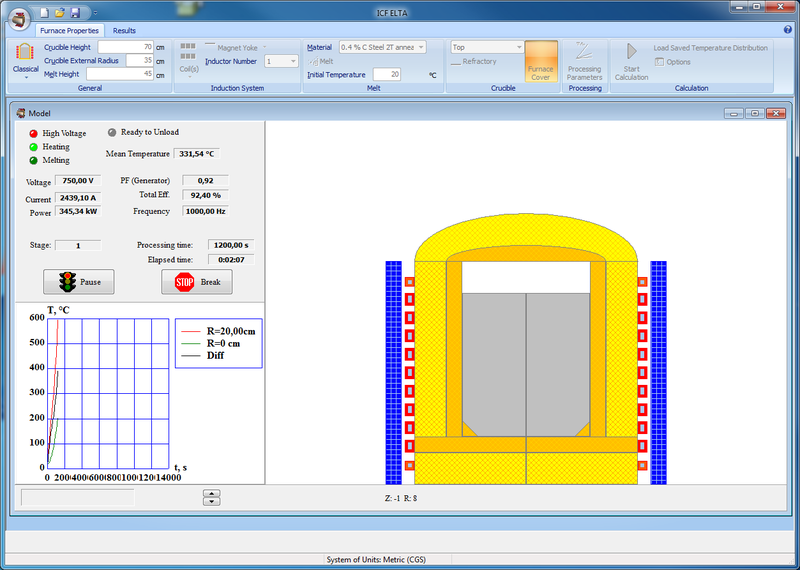 ICF ELTA has a database of a number of materials for the melt and refractory. It simulates the process from initial temperature, for example 20 °C or other, taken into account heat transfer through refractory. ICF ELTA can simulate the temperature distribution, taken into account stirring of melt, for example by electrodynamic forces. It can simulate the process after a partial unloading the melted metal and a loading of new part of cold metal. 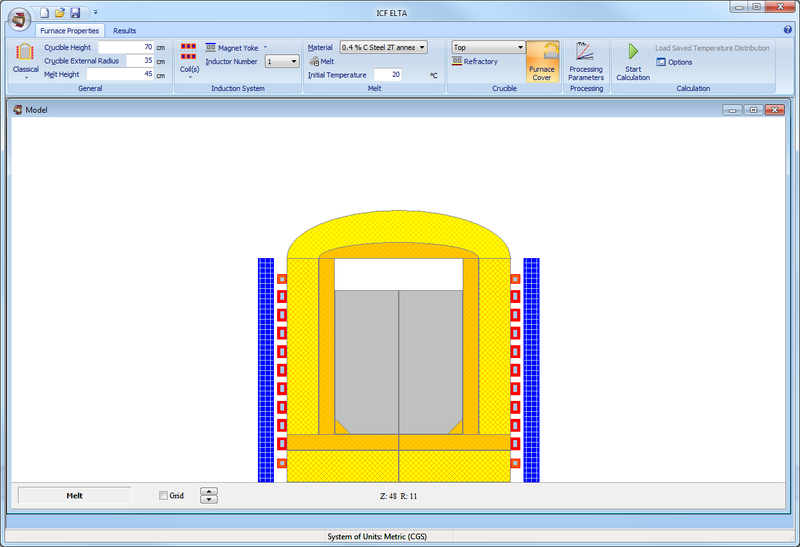 ICF ELTA can simulate the melting process in conductive crucible, because induction heating of the non-ferrous metal with low electrical resistivity in classical crucible is energy consumption, electrical efficiency is very low and can be increased only by use of conductive crucible from graphite or cast iron. 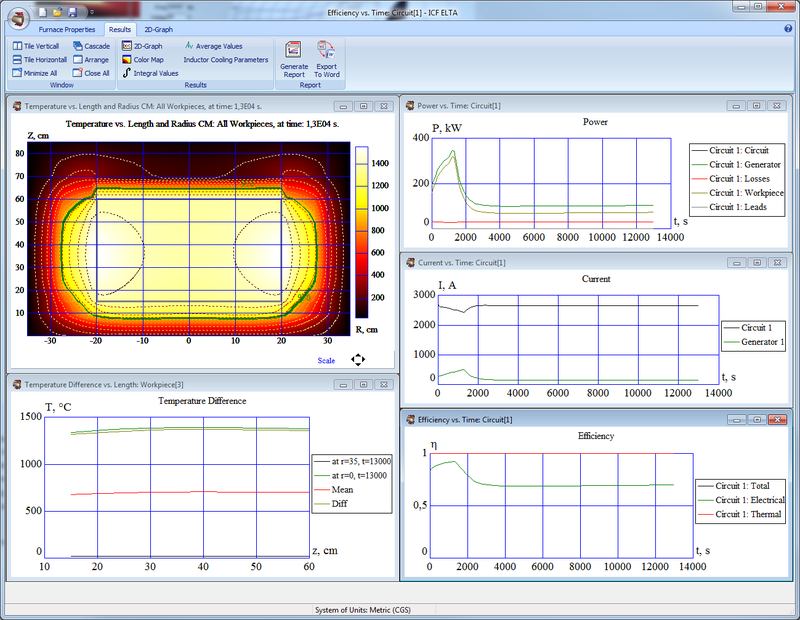 ICF ELTA makes hydraulic calculations for water-cooling of the inductor. The program calculates required Water Flow Rate, Section Number (parallel branches of water), and Pressure Drop for each stage and each circuit number. ICF ELTA has a built-in report with report templates created by users and can export the results in a Word format.